The information in this article is from The Rochester Courier and from a talk given by Harold Vickery to the Rochester Historical Society in 1964. He had talked with Mrs. Joseph May of Silver Street in Rochester, widow of one of the victims. A few details from marriage records and obituaries have been added. Dynamite Corner is about a mile from the Crown Point Baptist Church where the road from Merrill’s Corner entered Crown Point Road. Stephen Young had a large, two- story, square- shaped, farm house on the south side of the road close to the intersection. His barn was across the street from the house. In the fall of 1884 Stephen had decided to dig a new well near his barn. No sooner had they started the project than they ran into ledge. Stephen’s neighbor, Z. Taylor Berry age about 30 was helping him. Taylor Berry had recently returned from California where he had been involved in some mining. In spite of this experience, he did not feel he had the ability to use dynamite. It had been less than 20 years since its invention and it was known to be very dangerous and unpredictable. Mr. Young ordered some dynamite from Lowell, Massachusetts. George Young Jr. age 25, the son of George Young and Abby Railey, had been born and raised in Lowell. He had obtained some of his education in this area at Berwick Academy. He had some experience using dynamite while he was out West. He was in charge of its use for the well digging project. Dynamite was on the list of dangerous materials that the American Express Company would not carry. The dynamite was concealed in a laundry basket and covered with clothes to look like it was from the Lowell Laundry. The basket arrived at the depot in Rochester on the Boston, Lowell, Nashua, and Rochester train and it was carried to Strafford by an express wagon that traveled from Rochester to Barnstead regularly. The driver, Charles Parsons, had no idea what he was hauling in the laundry basket. It was cold outside and the well diggers were afraid the dynamite would not work if it got too cold so they brought it into the house. They hung some of it up in a row behind the kitchen stove. On Thursday afternoon, December 4, at about 5:00 the workers came into the house. They were neighbors, George Goodwin, Taylor Berry, and hired man Joseph May. George Young had a homemade detonator. He had been experimenting with it, but couldn’t get it to work. The men were nervous about his experimentation and went back outside. Soon Young called them in to supper promising that he would not work on the detonator. The men were washing up preparing for the meal. Joseph May was standing at the top of the cellar stairs wiping his hands on a roller towel that hung on the cellar door when he saw Young fooling with the detonator again. He was told to leave it alone; but he ignored the advice and brought the two wires together. The dynamite exploded. All four walls of the first floor of the house were blown out and only the corner posts were left standing, holding up the second floor. Ella Ready had been preparing the supper. As she opened the door from the dining room to the kitchen, the explosion threw her backward onto the dining room floor. She was unconscious. When she came to there was a heavy beam across her chest. She managed to lift the beam up, but her skirts were fastened down by debris and she could not get up. Neighbor, Joshua Berry, who had heard the explosion and came running, rescued her and another neighbor, Charles Brock, took her to the Berry’s house. Ella’s little sister, Maggie, was coming home from school late. Ella’s eyes were badly burned, but she was able to make out the sight of her sister coming over the hill and she was very relieved to see that she was safe. The Courier reported that Ella was badly burned about the face, arms, and wrists and she raised considerable blood. Her eyes became so swollen that she could not see, yet she had good courage and was able to joke to the reporter that she did not want anyone to see “how handsome I am”. Her little sister said that she wished it had been her in the house alone so the others would have not been injured. Ella eventually recovered from her frightful injuries. Sadie Greenfield and Stephen Young were sitting in the parlor when the explosion occurred. Stephen was found face down on the parlor floor. He was not seriously hurt. However, the Rochester Courier reported that because of his age, he might not recover from the shock. His friends disagreed and were hopeful he would recover. Mr. Young did live to age 91, eight years after losing his home and all of his possessions. Sadie was found lying on the ground some distance away from the house. It was said her body followed the walls out in the explosion. She was badly bruised, but she was able to make the trip back to her father’s home on Wakefield Street that night. The following June Sadie married George Young. George had been the first one found in the ruins. In spite of his being a large man weighing 240 pounds, he had been blown out of the back of the house. His clothes were on fire and he was terribly burned about the lower part of his body. He was taken to a neighbor’s, the Frank Young home. His recovery was slow but he did survive his injuries. He and Sadie married and lived in Concord, Massachusetts, where he worked as a prison officer for the next thirty years. He became ill and spent the last nine years of his life on Wakefield Street in Rochester at the home of Sadie’s father. He worked in Rochester as an automobile inspector. He belonged to seven organizations including the Masons, Knights Templar, and Odd Fellows. George Goodwin, one of the workers on the well, ran out of the ruins a moment after the explosion. His clothes were on fire. Neighbors put out the fire and assisted him to Mr. Berry’s across the street. He didn’t appear to be seriously injured. Mrs. Berry was washing his face as he was telling her about the explosion, when he suddenly said,” I am going to die. I’m bleeding inside.” He did die a few hours later. He left a grieving widow and two small children. No one knew where Mary Ann Young had been at the time of the explosion, but she was found unconscious at the back of the house under a pile of debris. She too was taken to Joshua Berry’s home. As she drifted in and out of consciousness, she often repeated, “I told him not to fool with it.” Mary died four days later of her injuries. She was remembered as a very well known and loved woman, the mother of one son, Stephen Young, who had recently earned his medical degree and was later a doctor in Rochester. Joseph May often worked for Stephen Young as a hired man. The newspaper referred to him as a German immigrant boy, but records show he was born in Philadelphia. Mr. May was found in the cellar under a pile of debris. He was rescued by Benjamin Berry, George Brock, and W. P. Stanton. He, too, was burned, badly bruised, and delirious for several days. He was treated along with three others in the home of Joshua Berry by several area doctors. He recovered, but lost the sight in one eye. Joseph was the last person rescued. After his rescue the remainder of the house burned to the ground. The eighth victim of the accident was Z. Taylor Berry. He was found buried in a pile of rubble at the back of the house. His clothes were on fire. His rescuers threw water on him. He, too, was taken to Joshua Berry’s makeshift hospital with severe burns, bruises, and an injured back that left him paralyzed from the waist down. The paper stated that “he cannot live.” Taylor Berry had been in the army and fought in skirmishes in the Black Hills of North Dakota before going to California where he had worked hard and done well so that he had bought livestock and an interest in a ranch. He had recently sold out and returned to Strafford to try to convince his father to go back out west with him. Taylor suffered three years with his injuries. His father James Huckins Berry, of Second Crown Point Road sued and was rewarded $5,000, a considerable sum at the time. He had these words inscribed on his son’s grave stone,” Here lies my darling only son, caused by a rebel whose name is Young. Z.T. 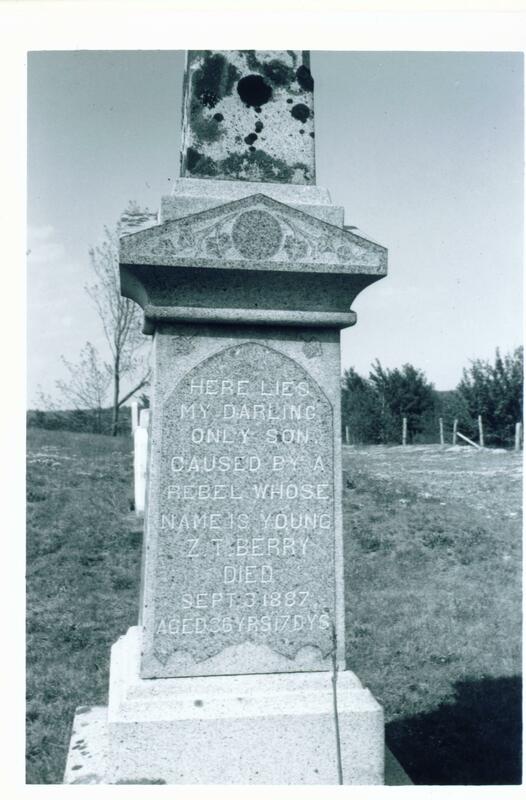 Berry Died September 8, 1887.” This monument is in the cemetery beside the Crown Point Baptist church. And injure friends where e’er you go. On Crown Point Road in the Granite State. Prosperity through their household run. Played with them as he would a toy. And left the inmates in despair. To help them and to see and hear. Stunned and bruised, they quickly learned. Their money and their goods the same. To be waited on in foul or fair. Torn from his children and his wife. And soon they are called and taken away. You will find these lines are surely true.